21st Jaunary, 2013 - Sneeze in Madrid - Sneeze will screen in the Madrid Creative Commons Film Festivalon the 26th of January. 19th May, 2012 - Sneeze keeps on going... - Sneeze screened last week in the Pirate Party Film Festival. 14th January, 2012 - Sneeze is popular - After less than a month on Vodo, Sneeze is the 23rd most popular film out of the 134 films! 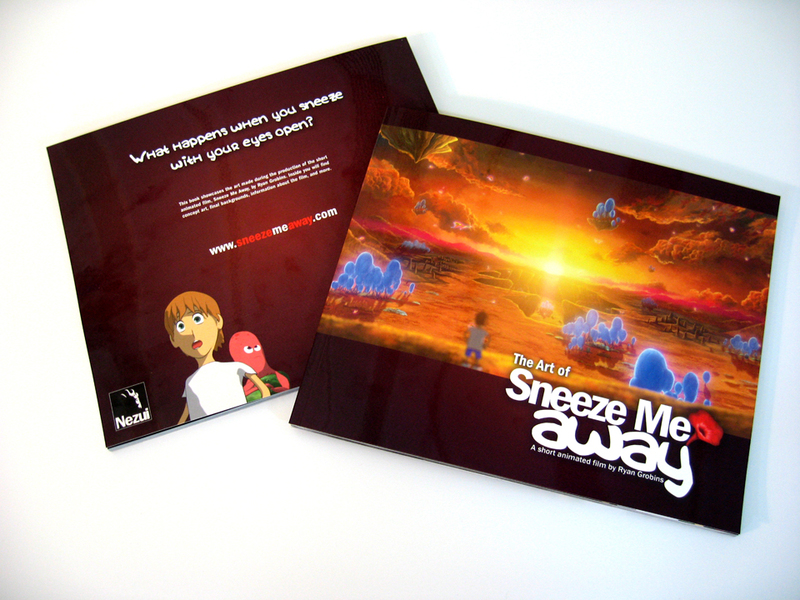 5th January, 2012 - Win a copy of The Art of Sneeze Me Away! - Visit Vodo, to find out more. 20th December, 2011 - Sneeze on Vodo - Sneeze has been included on Vodo, a website dedicated to promoting films via BitTorrent. 12th November, 2011 - Sneeze in India - I just found out that Sneeze was screened last month at the Jaipur International Animation Film Festival. 3rd September, 2011 - Sneeze on The Foundry's 2011 showreel - Saw this today, (at 2:36) what an honour to be alongside the best in the world! 2nd September, 2011 - Sneeze in Atlanta - I only just found out today, but you can watch the film at the Atlanta Underground Film Festival. 1st September, 2011 - Watch Sneeze Me Away online - It's finally online, you can either watch it from the media section, or on Vimeo. 31st August, 2011 - The end of the end - Read the latest in the blog section! 20th July, 2011 - Director's Choice - Sneeze won the Director's Choice award in the anime section of the California International Animation Festival! 16th July, 2011 - First physical award and prize money - See the award I won from the recent HDSIFF in the blog section! 7th June, 2011 - News about Sneeze's recent win - Head over here to read more on the winners at the HDSIFF. 4th June, 2011 - Stay current with Nezui on Facebook - Please don't forget to scroll to the bottom of this page and hit the Facebook "Like" button. 31st May, 2011 - Best Animation - Sneeze wins Best Animation at the High Desert Shorts International Film Festival! Woohoo! 5th May, 2011 - Award - At the Kids First! Film Festival 2010, Sneeze won second place in the "Independant Short, Ages 5-8" category. 24th April, 2011 - Back to California - The California International Animation Festival will screen Sneeze in June. 3rd April, 2011 - Milestone reached - Sneeze Me Away has now been accepted into it's 25th film festival, which was the upper limit goal I had for it. 2rd April, 2011 - Sneeze in Florida - Sneeze will be screened at the Downtown Boca Film Festival on the 12th of April. 21st March, 2011 - To the Caribbean - The Puerto Rico International Film Festival will screen Sneeze in late June. 2nd March, 2011 - Sneeze wins an award - Sneeze will be given an Award of Excellence at the Canadian International Film Festival on April 3rd. 22nd February, 2011 - Sacramento selects Sneeze - The Sacramento International Film Festival will screen Sneeze on the 15th of April. 10th February, 2011 - Greece! - Athens Animfest will screen Sneeze in the International Programme #5 on the 17th and 18th of March. 18th January, 2011 - Sneeze in the desert - The High Desert Shorts International Film Festival in Nevada will screen Sneeze on the 27th of May. 3rd December, 2010 - Russia part 2 - Sneeze was invited to screen at the 4th Winter International Festival of Arts in Sochi (no link yet). 11th November, 2010 - Sneeze in a new continent - The African International Film Festival accepted Sneeze for screening. 17th October, 2010 - Best Animation Award - I was just notified that Sneeze won an award at the Hyart Film Festival. 7th October, 2010 - Sneeze for children in LA - Sneeze was accepted into the 6th Annual Los Angeles International Children's Film Festival. 4th October, 2010 - Films in a flat land - The Flatland Film Festival will screen Sneeze on the 16th of October. 30th September, 2010 - Good 'ol Kentucky - Sneeze will be shown twice at the River's Edge International Film Festival in November. 13th September, 2010 - Get ready Cincinnati - Sneeze plays at the Cincinnati Film Festival in October. 9th September, 2010 - This time it's Germany - Check out Sneeze at the Radar Hamburg International Independent Film Festival. 6th September, 2010 - Another Festival - The Linoleum Animation Festival in Moscow Russia, nice! 3rd September, 2010 - Another Festival - Sneeze can be watched at the SoDak Animation Festival in October! 1st September, 2010 - Finalist - Sneeze has made it as a finalist in the 8th Annual iP Short Film Contest run by Indie Producer. 26th August, 2010 - Festival update - The Philly Film and Music Festival will screen Sneeze (though the website dosen't mention it yet). 22nd August, 2010 - Another festival - Banjaluka, an animated film festival in Bosnia and Hezegovina. 21st August, 2010 - The Post-mortem - part 2 - The second part of my thoughts on the making of Sneeze Me Away here. 12th August, 2010 - Another screening - The Silicon Valley Film Festival. 12th July, 2010 - AEAF - I used to attend the Australian Effects and Animation Festival when I was young, now I am showing in it! 8th July, 2010 - Article about Sneeze Me Away - Digital Media World covers information on the making of Sneeze. 5th July, 2010 - Another festival - The Rome International Film Festival. 27th June, 2010 - Two more festivals - Official selections for Crystal Palace International Film Festival and Animation Block Party. 19th June, 2010 - Hyart Film Festival - Sneeze has made it into the official selection of this festival. 15th June, 2010 - Sountrack update - A bonus track was added to the OST. You can download it here. 10th June, 2010 - Rejections, reflections and me - It's time to talk about the other side of Sneeze Me Away here. 8th June, 2010 - Gallery update - The gallery has been updated with more images. Check them out here. 30th May, 2010 - Download the Sountrack - The OST is available to download here. 26th May, 2010 - Sneeze Wins it's first award!!! - The short won Jury Choice Gold Medal for Excellence at the Park City Film Music Festival. 22nd May, 2010 - Presskit available - Download it here (13mb). 17th May, 2010 - The Art of Sneeze Me Away is ready to own! - It's finally available, see below for more details. 27th April, 2010 - Festival season - Sneeze has been entered into about 20 festivals so far, with more to come. 21st April, 2010 - An interesting thought. - It just hit me the other day, that with the completion of Sneeze, I finally am a director! 16th April, 2010 - Sneeze gets an IMDB page - Sneeze Me Away was recently granted an IMDB entry. Vote for it to show your support! 10th March, 2010 - The Post-mortem - part 1 - Read on for my thoughts on the making of Sneeze Me Away here. 1st March, 2010 - Finished; for real this time - The sound and some shots have been tweaked. Read more here. 24th January, 2010 - Download the Trailer! - The official Trailer for Sneeze Me Away is now available here. 19th January, 2010 - The Art of Sneeze Me Away preview copy arrived! - This is so cool! blog section. 1st January, 2010 - Screening success - Sneeze was seen finally on the big screen, read more in the blog section. 20th November, 2009 - Preview of The Art of Sneeze Me Away - For a small preview of this book, go to the blog section. 19th November, 2009 - Nezui is launched - The new name which films by Ryan Grobins will be released under: www.nezui.com. 15th November, 2009 - The Art of Sneeze Me Away - An 80 page, full colour book that showcases the art of the film will be ready soon to buy. 6th November, 2009 - Last shot finaled! - All that's left now is the final sound mix. 3rd August, 2009 - Gallery Update - The gallery has been updated with the offical poster and some concept art. 14th July, 2009 - Not yet ready - Mid 2009 has come and gone, but Sneeze Me Away is not ready yet. 30th June, 2009 - We were broken into! - Recently we had some equipment stolen. Find out more in the blog section. 12th May, 2009 - Using Orchestrated Music - My musings on using orchestrated music can be found in the blog section. 6th May, 2009 - Final orchestral music sessions recorded in Czech Republic finished - And it sounds wonderful! 14th April, 2009 - Seeking an extra Background Artist to join the team - Position filled! 13th April, 2009 - New entry in the Tips section - Making Backburner work with Nuke using tcl. 10th April, 2009 - New entry in the Tips section - Automatic unique and sequential job ID's with Backburner and Maxscript. 8th April, 2009 - New entry in the Tips section - Helpful ulilities to get your pipeline running smoothly using XP. 15th September, 2008 - Download the Teaser! - The Teaser for Sneeze Me Away can be downloaded here. 14th September, 2008 - Subscribe to the Sneeze Me Away newsletter for any updates - Click here. Sneeze Me Away is finally online! If you enjoyed it, don't forget to hit the "like" button, or feel free to leave a comment in Vimeo, I'd love to hear what you have to say. Also, don't forget to download the amazing soundtrack here. This book showcases the rich art made during the entire production of this short animated film. 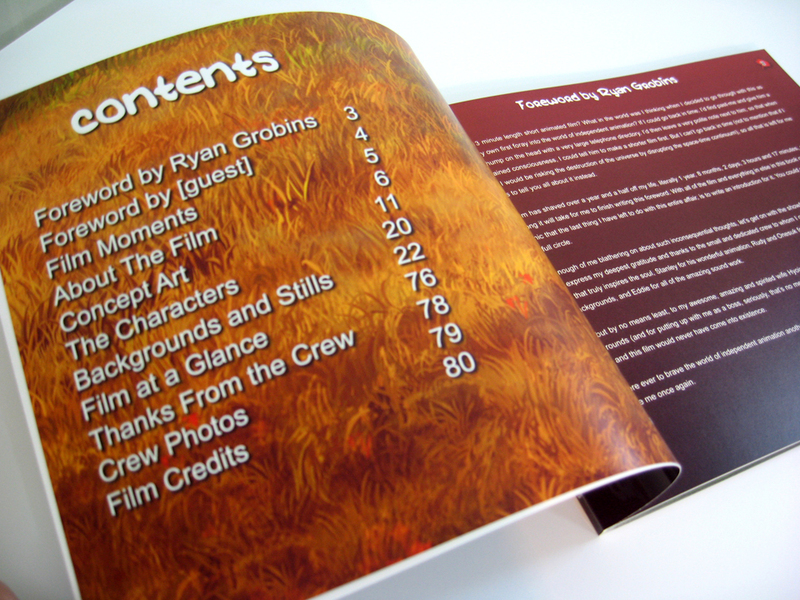 Inside you will find 80 full colour pages filled to the brim with concept art, final backgrounds, information about the film, and much more. 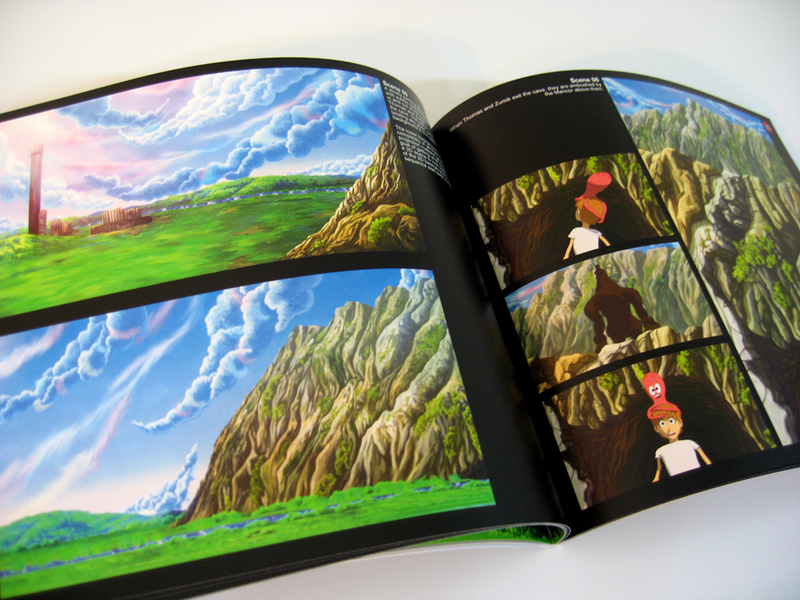 Printed on higher quality Premium Paper, this book is perfect for lovers of animation, independent film and art. Please help support independent animation by buying a copy for yourself today! Just click on one of the book covers, and you will be able to visit the world of Sneeze Me Away yourself and see all of the hard work that went into making this short animated film.